Audi's entry-level convertible car has been a sales winner for the firm, matching premium style and refinement with relative affordability and a good range of engines. It's never been particularly good to drive and its buyers haven't needed it to be, but this all-new model makes use of a lighter, more advanced chassis and aims to enliven the driving experience. 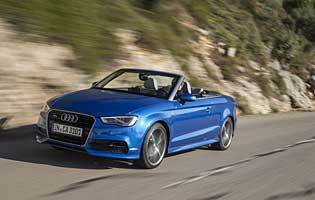 The UK is a particularly strong market for compact convertibles like this new soft-top A3. Even though we as a country have one of the lowest amounts of sunshine every year among European nations, British buyers simply adore convertibles. Many owners rarely fold the roof down at all but the style statement is held to be a powerful and desirable one. Part of the engine range is carried over from the previous A3 Cabriolet, but otherwise it's an all-new vehicle. Lighter, with a longer wheelbase, more interior space and the latest generation of technologies, it aims to build on the success its predecessors enjoyed. Some of the engines might look the same on paper but are actually substantially reworked for this generation. The revised engines help to give most of the new A3 Cabriolet variants a numerical advantage over their rivals, with lower CO2 bringing lower road tax charges, theoretically cheaper insurance coming from intelligent damage-mitigating design and often better performance in the shape of faster acceleration or higher top speeds. Audi is also seeking to banish ride quality demons that have plagued it for some years. New suspension systems within the reinforced MQB chassis aim to provide greater comfort without the unwanted body roll that comes with soft and inadequately damped springs. This car is targeted at the same audience as ever, but improves the areas where it had fallen behind. The overall result of the A3's improvements is a resounding success. 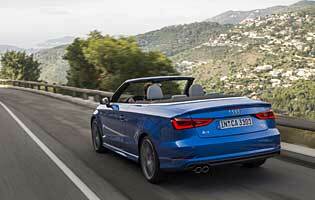 The new A3 Cabriolet is better to drive than the old one, with improved engines and suspension. It's a car that owners of older A3 Cabriolets can be familiar with and upgrade to, without feeling stuck in the past. Imperfections like the sat-nav, the coarse diesel and some areas of poor panel fit cannot spoil it. This is, on paper, the cheapest A3 Cabriolet to run, with low CO2 emissions and theoretically high efficiency, although because the engine is tuned for economic driving it suffers badly if used unsympathetically, with fuel economy figures dropping dramatically. Residual values are encouragingly good, with a reliable demand for good condition used A3 soft-tops over the last few years. A higher list price means that this isn't as cost-effective a business user's car as the hard-top versions, though. 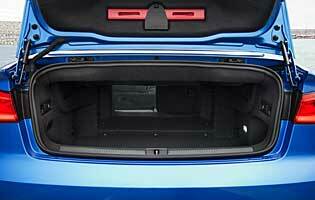 At 275 litres the boot is more than 100 litres smaller than that of the three- and five-door hatchbacks, but while it has been shaped to give as much space as possible the boot sides still taper in towards the seats, making it difficult to fit more than one large case in the boot at a time. Two adults plus primary school-age children should still find it big enough for a weekend away. In the cabin there's a basic assortment of a restrictive glove box, spacious door pockets and sizeable cup holders. The main instrument cluster is the standard Audi unit seen in the other versions of the A3, with a mix of black dials, white illuminated numbers and red detailing including the needles. It's neither new nor exciting but it does the job efficiently, with alternating speed increments in large and small figures to differentiate and separate them. The highlight is the main interface screen, which rises out of a slot at the top of the dashboard neatly and elegantly, giving a premium impression. Front seat occupants will notice that the standard seats are rather wide, and only broad people are likely to feel properly supported laterally. Another problem is at the rear seats, the backs of which are too upright for true comfort and the legroom for which has been squeezed to the point of making them redundant for adult passengers. Children may find the available space fine, but the A3 Cabriolet is best used as a 2+2 seater rather than a true four-seater. Only Sport and S line models feature the uprated, thicker and more sound-proof hood, however. Security has never been a problem for Audi in its recent history and generally it puts maximum effort into preventing the theft of any of its models regardless of price. Few details are actually available to prevent criminals gaining an insight into what they're dealing with, but the security systems include remote central locking, an alarm that knows whether the roof is up or down, and a secure boot that cannot be accessed from inside the car. The key bases are covered with the standard-fit safety equipment, but many of the additional features are optional extras, and often not cheap. Xenon headlights with cornering function to better illuminate the road around corners are among these options, but at least there is a full spread of highly-advanced airbags throughout the cabin and a comprehensive array of active safety assists, like stability control. Blind spot warnings and adaptive cruise control are again optional at this level. In this area the A3 Cabriolet is much improved over its predecessor. What used to be a dull and lifeless driving experience is now blessed with a sense of agility and nimbleness that isn't entirely dialled out by the numb but accurate steering. There is a little bit of zest underneath the latest A3 chassis. Unfortunately, in this model the positives are counteracted by the engine, which is noisy, characterless, weaker than it looks on paper and generally best suited to low-stress, gentle driving. While the A3 Sportback, with its five doors and larger boot, makes an ideal car for a young family, the Cabriolet is less convincing. It simply doesn't have enough conveniently-accessible space for most pushchairs and large accessories or toys, although everyday items will fit. Child seat mounts are present to account for the family buyer, but older children may be put off being picked up at the school gates in convertibles unless the roof is firmly in place. There's no doubt that a compact diesel convertible like this will have huge appeal to some first-time car buyers who prioritise style, badge appeal and low running costs. It's rather expensive for a first car, though, and even though the insurance grouping is lower than those of its main rivals, it's still likely to be beyond the reach of young buyers who've recently passed their driving tests. With this engine the soft-top A3 is very user-friendly, though, and is unlikely to intimidate even new drivers. Audi is one of Europe's three main premium car makers and as such enjoys a continuing reputation for quality. Such is its sway with buyers that not even persistent poor results in large-scale reliability surveys have dampened the public's desire for cars bearing the famous four rings. The car itself does exhibit some mildly concerning examples of poor panel alignment and inconsistent fit, perhaps revealing where costs have been squeezed, but on the inside the car feels more premium. As a two-door convertible, accessibility is fraught with issues when compared to cars that have been designed primarily for practicality. The doors aren't as long as they might be, which does limit the extent of any difficulties in getting out without letting the tip of the door hit an adjacent car, but that same quality makes it all the harder to access the back seats - especially with the roof up. Retract the soft top and it becomes much easier. On this model a large colour screen rises out of the dashboard with the activation of the car's ignition. Through it the vast majority of the car's systems can be controlled and that includes the stereo, which is accessible through pushing a button marked 'Media'. There are input ports for USB cables, 3.5mm auxiliary leads and CDs, with Bluetooth and DAB digital radio also in the mix. It takes a little time to become familiar enough to work the system quickly. The Cabriolet makes the most obvious lifestyle statement of all of the A3 variants, and with that comes colour choice. White, silver and black simply don't do the convertible justice and should be ignored in favour of vibrant and rich shades of red and blue. There is also a yellow, which in the metal will polarise opinion sharply. The interior trim is rather more standard Audi fare, with relatively wide seats and high-quality materials covering most surfaces. One of the intrinsic advantages of a compact convertible is that along with the style and potential for open-top motoring, they are naturally more capable in urban environments. The A3 Cabriolet has a slightly modified set of dimensions compared to the hatchbacks, being wider and slightly longer, but not by enough to impede its entry into typical parking bays. The steering lock is average and good enough for all but exceptionally tight manoeuvres, and optional parking aids include sensors and cameras at both the front and rear. Petrol engine options - 1.4-litre (138bhp); 1.8-litre (177bhp). Diesel engine options - 1.6-litre (108bhp); 2.0-litre (148bhp, 181bhp). Transmission options: six-speed manual gearbox, plus DSG twin-clutch automatic. Trim levels: SE, Sport, S line.